If you're ready to think outside the box, you may want to consider a house plan with curved spaces. There are so many architectural styles that feature curved space, from urban farmhouses to European manors. There's something for everyone! A tall arched portico entry paired with vertical siding and a red front door creates an ideal urban farmhouse exterior. Eyebrow dormers with a stucco and stone exterior create a timeless European facade. Add arched garage doors or an arched entry porch framed in columns for a simple Country exterior. A barrel-vaulted ceiling in the great room, kitchen or even a bedroom or study is an instant focal point for the room. A curved staircase or an arched clerestory window brings elegance and sophistication. A bowed wall of windows not only creates architectural interest but also expands views. 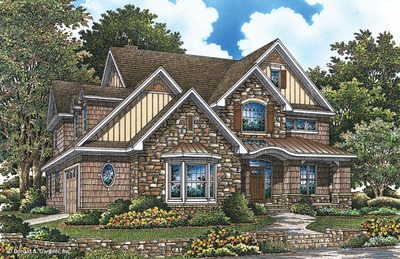 The Carrera homeplan 1178 is highlighted with arched dormers, windows, and a portico entry. This European manor continues the theme inside with a gorgeous curved staircase, arched art niches throughout, and an arched island bar in the kitchen. 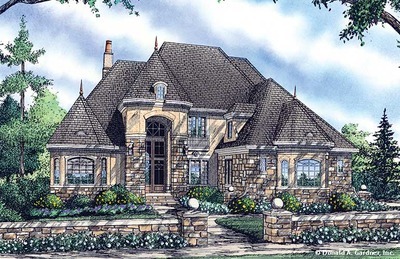 The Monarch Manor house plan 5040 features an arched portico entry to welcome guests to this luxury floor plan. The great room is adorned with a stunning barrel-vaulted ceiling and bay windows in the great room, master bedroom and bathroom, and the screened porch expand views of this lake-front property. Curved spaces in your dream home plan can be simple and understated in a Country charmer house plan or they can become elaborate focal points with European flair. 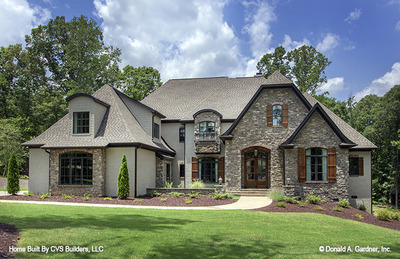 Regardless of your style, Donald A. Gardner Architects has an extensive portfolio of dream home plans and a dedicated team that is here to help you find the perfect house design.